For example, Creme Eggs, Toffee Eggs or Mini Eggs. 1. Preheat the oven to 180C (fan 160C), 350F, Gas Mark 4. Using a pencil, mark a 9 inch circle on a large piece of baking paper. Lay it upside down on a large baking sheet and set aside. 2. Melt the butter and set aside to cool a little. 3. Toss the flour, cocoa powder, sugars, chocolate chips, bicarb and salt together in a large bowl and make a well in the centre. 4. Add the melted butter, egg and vanilla extract and mix until it comes together as a soft dough. Knead it lightly on a clean surface to a give a smooth ball. Place in the centre of the marked circle and using a rolling pin, roll it out to the 9 inch disc, about 1 cm thick. 5. 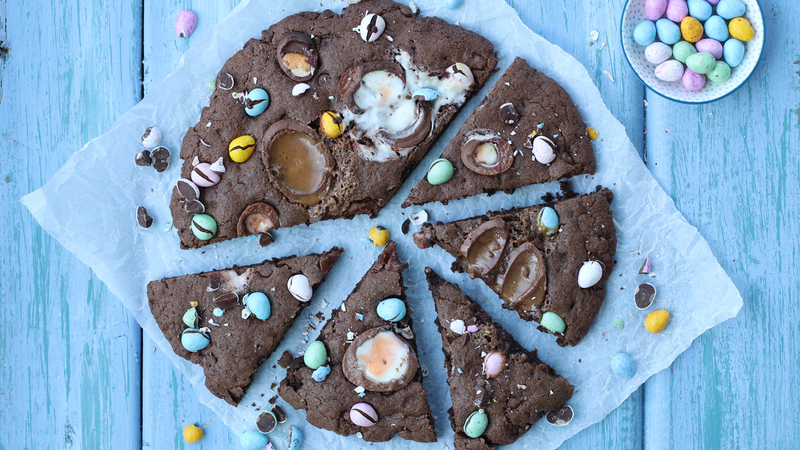 Arrange the topping chocolates all over the top of the cookie pizza, splitting any filled eggs open in half to reveal their gooey insides. Reserve a little for serving if liked. 6. Bake for 12-15 minutes until the cookie is set around the edges but still slightly soft in the centre. Remove and leave to cool completely to allow it to set firm. 7. Slide onto a serving plate or board. Chop any reserved chocolate into pieces and scatter over the pizza to decorate further. Cut into 8-10 wedges and serve. Use 225g of plain flour and omit the cocoa powder for a slightly lighter, double chocolate mixture if preferred.